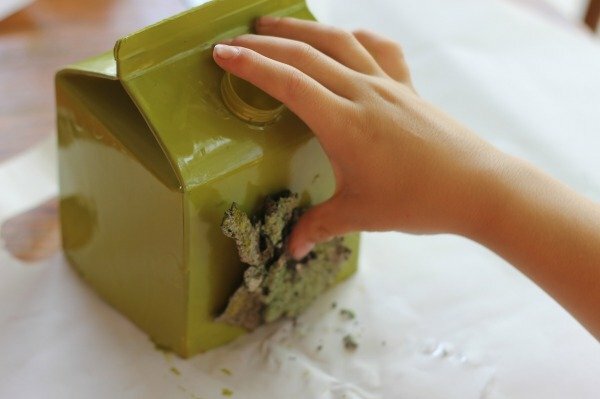 We love upcycling things that would typically be trash, and this Upcycled Milk Carton Gnome or Fairy Garden Home was a great project for the kids. 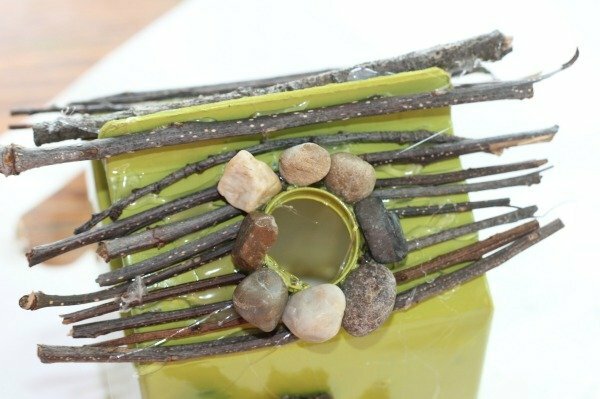 The kids and I love buying cute little pieces for our gnome and fairy gardens but they can start to become costly so sometimes we turn to our craft stash, backyard, and recycling bin to create new features. This cute little “Gnome Home” my son and I crafted from an old almond milk carton, and some treasures from our yard was tons of fun and very inexpensive. 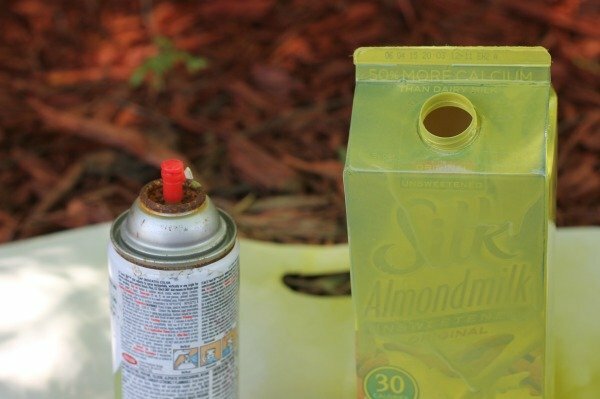 This is perfect for an afternoon project to occupy your kids this summer! So, if you have an itch to create a welcoming abode in your garden for gnomes or fairies then grab some supplies and let’s get started, this project cost me nothing as I had everything on hand- gotta love free! collected yard treasures- leaves, pine cones, acorns, bark, pebbles, etc. or craft items from your stash! Wash your carton well inside and out, I like to swish a little bleach and water inside to clean it. Cut carton in half or how tall you like it to be, take your carton outside and place on newspaper or similar. Spray well with a light coat of spray paint, you can also paint by hand with acrylic paint and a brush, we were aiming for quick, allow to dry for 5 minutes, continue adding coats until well covered. Allow to dry for 1 hour after final coat. You can use found items in the home like buttons, ribbons, paint pens, glass beads, pony beads, string, stickers, or anything else on hand. We took a basket outside and hunted for treasures in the yard so it would have more of a natural look. My son found this hunk of tree bark and declared it a perfect door. 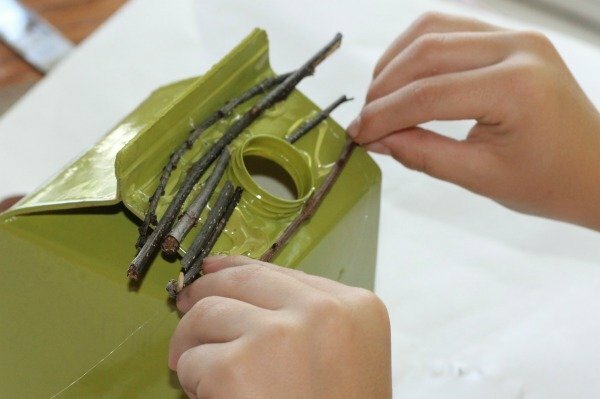 Next I added a generous amount of hot glue to a portion of the roof and let him add sticks holding them by the tips to be safe, he never even had to touch it. We thought the spout looked like a chimney but needed a little help so again I used the glue gun and he placed small smooth stones to build it up (these were actually purchased by the bag at Dollar Tree for our sensory bins) . Let your child add whatever decorations they like, or keep it simple. Trim off excess hot glue strings. If using it outdoors I would recommend a coat or two of clear sealer to help it last. 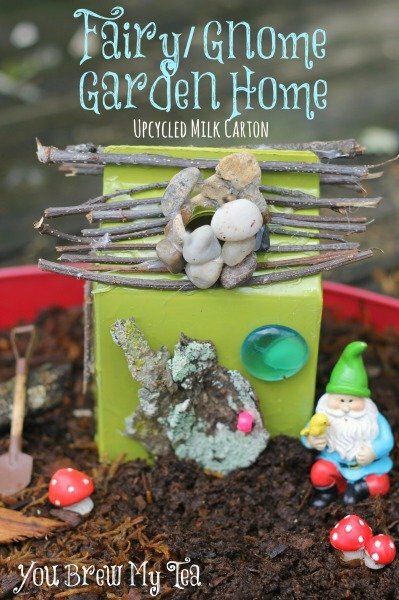 This upcycled milk carton garden gnome or fairy garden home is a great afternoon project for your kids this summer. Not only will they be excited to make something themselves, they can quickly and easily make it truly unique to their personality. 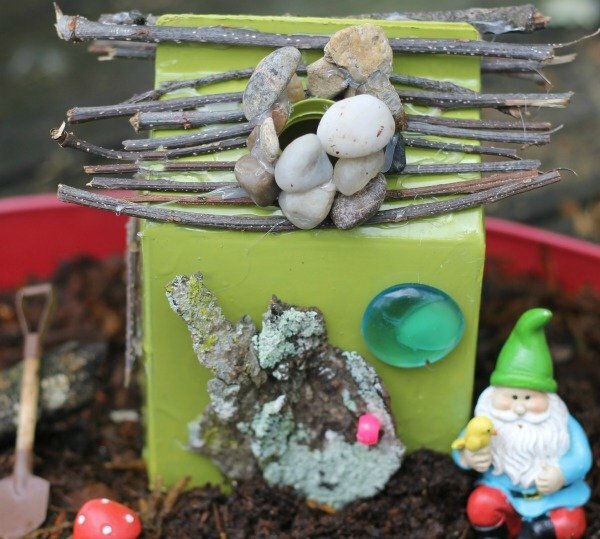 We love the idea of building a creative and imaginative miniature home for pretend play. This is not only a great way for your kids to spend their time this summer, it can be an excellent way to build their imagination. Check out some of our other favorite projects for kids! Hi ~ I’m visiting from the Moonlight & Mason Jars Link Party. My kids and I made fairy gardens last summer, and they loved it! But the supplies can get really expensive. So, this is a great option. 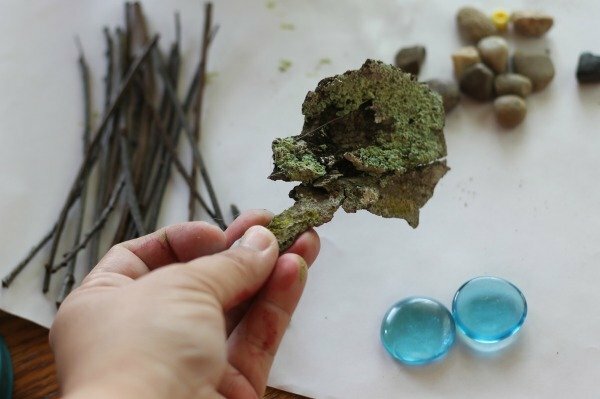 I can’t wait to have the kids make their own fairy garden items. Thanks for sharing! How cute! Thanks for linking up to Merry Monday! Sharing on MM Pinterest Board! Have a great week! I have always wanted to make a fairy or gnome house! I love how you recycled stuff to make this. Too cute! Have you linked up at #everythingkids yet this week? You should!